It’s surprising how starting a blog can feel like developing a friendship. I love the comfort of old friendships, friends with whom I crossed adolescence, with whom I exchanged notes in classrooms and whispered into the night. So much is understood between the lines, decades of conversations, of sitting around each other’s dinner tables, of sharing heartbreak and loss and journeys into adulthood, providing a rich, lush context. New friendships have a magic of their own- unchartered waters, so many new things to share, and, upon retelling, view in a new light. There’s a dose of uncertainty, and you dip your feet in slowly, gauging reactions. You sit down for coffee, and have so many places to explore, so many things yet unsaid. For example, I haven’t told you yet that in a past life, Yaki and I started a gourmet gift basket company. A fact I’ll have to share to provide context for these cookies. We designed a collection of gift baskets, and we scoured the country for unique items to feature in each. 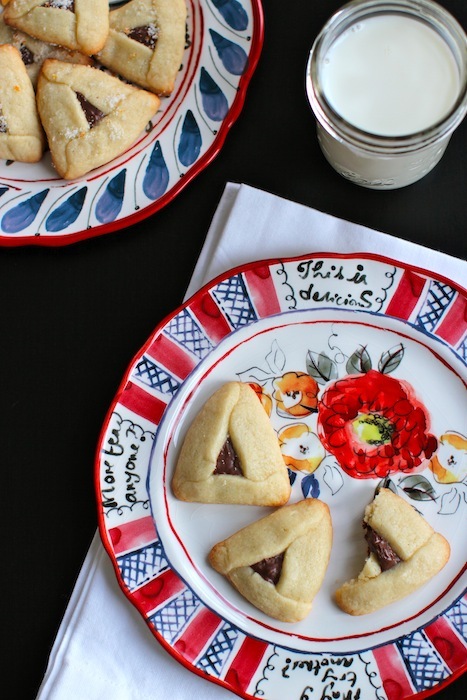 When it came to baskets for Purim, we knew we wanted to include Hamantaschen, the classic Purim treat. We made the rounds of bakeries, and ate our way through disappointment after disappointment- one after the other dry, teetering towards stale, fillings emaciated and dull. And then, we found Ben-Ami Bakery. One bite of their small, dainty Hamantaschen, and we knew we had found something special. The cookies were flaky and buttery, with bright and flavorful fillings, from caramel and prune preserves, to poppy seed and chocolate. Cookies so good, you wouldn’t want to relegate them to one day a year. So when I was looking for a Hamantaschen recipe, I had Ben-Ami’s cookies on my mind. I scoured the internet, looking at pictures, reading articles, posts, and comments. When I read that Alice Medrich uses a sugar cookie dough for her Hamantaschen, I quickly bookmarked her recipe. I stumbled upon dozens of horror stories, from dough that tore and was impossible to shape, to cookies that plopped right open in the oven, and I read through countless comments duking it out on the virtues of pinching versus folding. 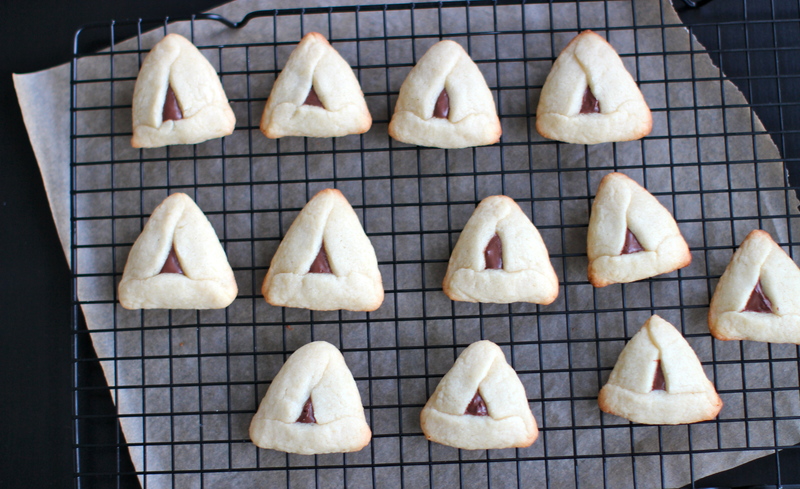 For the record, all of the posts advocating pinching had photos of Hamantaschen that had yawned wide open in the oven, while folded ones seemed to retain their shape. (Apparently, I now have just as heated an opinion on the matter). The sugar cookie dough comes together breezily, and tastes as rich and buttery as it looks; I know because I ate tiny scoops of it straight from the bowl. The next day, I took the dough out of the fridge, put on my coat, and went out to buy a jar of Nutella (what a fragmented, voyeuristic view into the lives of people the owners of bodegas must have), and got started. Buttery dough likes to be kept cold, and if you pay attention to it, placing it in the fridge whenever it gets a little warm, it will acquiesce to your rolling and cutting and shaping without a whimper or a crack. It might give you the impression of a mild case of schizophrenia, but trust me, it’s worth it. The cookies emerge from the oven pale and slightly golden at the edges, like a Victorian lady after a stroll in her rose garden. They are snappy and sweet, the butter luxuriously melting on your tongue. And in the center of all this: Nutella. 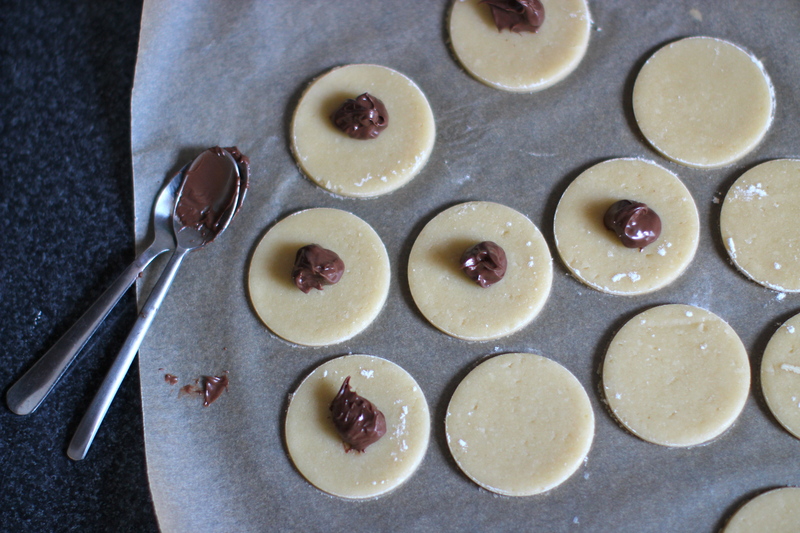 I mean, close your eyes for a moment, and imagine a sugar cookie folded over Nutella. I could have started and ended right there. 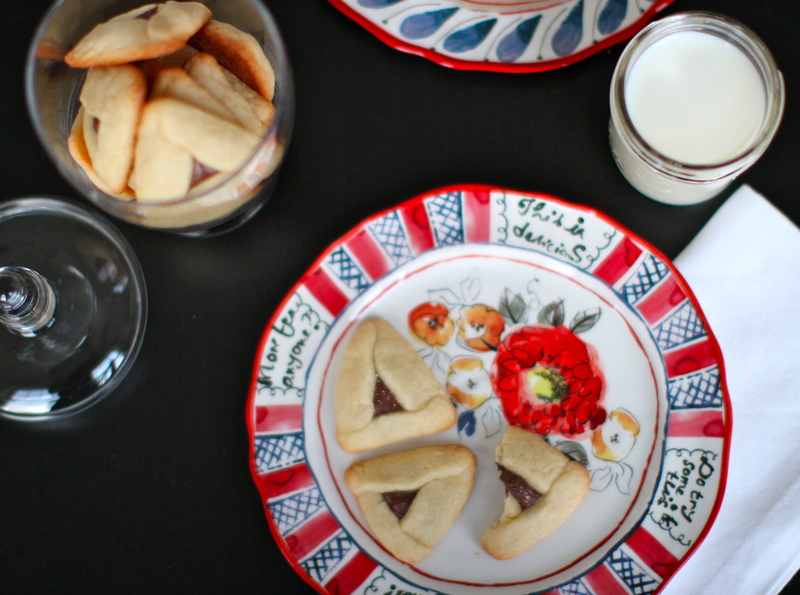 This recipe uses a classic sugar cookie dough formed into Hamantaschen. The results are a sweet, snappy, buttery dough that rivals the filling for your attention. The sugar cookie dough is Alice Medrich’s, I adapted the method and directions slightly to reflect my process. Fill them with Nutella, or your favorite jam or marmalade (dulce de leche, apricot preserves and black cherry jam are some of my favorites). This dough is easy to work with and form into triangles, the trick is to keep it as cold as possible throughout the process. Parchment paper makes this whole process a breeze, so make sure to have a roll on hand. Also, don’t be frightened by the length of this recipe- it’s mostly just me chatting to keep you company, so that it all goes by as smoothly as possible. You’ll need to refrigerate the dough for a few hours (or overnight) so be sure to plan ahead. Recipe doubles easily. In a medium bowl, combine the flour, baking powder, and salt, and whisk thoroughly. Cream the butter and sugar in the bowl of an electric mixer until light and fluffy, 3 to 4 minutes. Beat in the egg and vanilla. On low speed, beat in the flour until just incorporated. Scrape the dough together and knead it once or twice with your hands until smooth. Divide the dough in half and form each into a flat patty. Wrap and refrigerate the patties until cold and firm enough to roll, preferably several hours or overnight (and up to 4 days, or freeze for longer). Remove one patty from the refrigerator and let it sit at room temperature until supple enough to roll, but still quite firm and cold (about 1/2 hour). It will continue to soften as you work. When the first patty is ready to use, remove the second patty from the fridge, and let it sit on the counter. Roll the first patty between two sheets of parchment paper (or plastic sheets from a cut-apart resealable bag) to a thickness of 1/8 inch (1/3 cm). 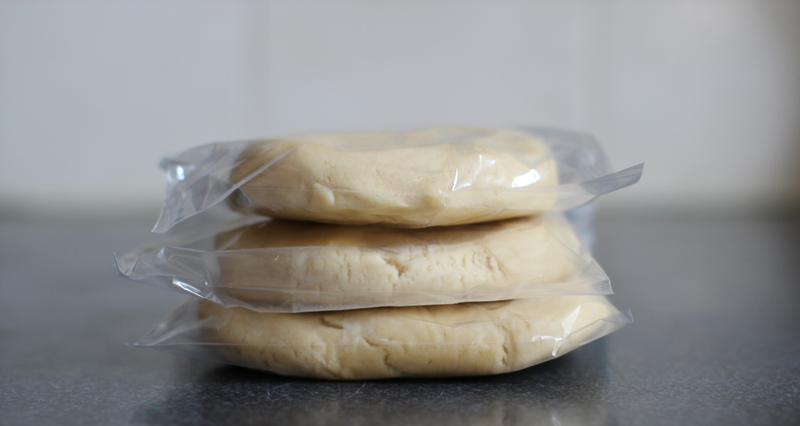 Turn the dough over once or twice while rolling, to check for deep wrinkles; if necessary, peel off and smooth the paper over the dough before continuing to roll it. When the dough is thin enough, slide it (still between the sheets) onto a cookie sheet and refrigerate. Repeat with the second patty, placing it in the fridge when done. Remove the first sheet of dough from the fridge. Peel off the top sheet of paper, and set it on the counter. Invert the dough onto it, and peel off the second sheet. Cut cookie shapes as close together as possible to minimize scraps, dipping the edges of the cookie cutters in a small bowl of flour as necessary to prevent sticking. (I used a glass with a 2 1/4 inch/ 6 cm opening; I think going much smaller would make them difficult to shape). Gently lift scraps up towards you, pulling from a top corner. Using two teaspoons, place a half teaspoon of Nutella (or filling of your choice) onto the middle of each cookie (don’t give in to the temptation to overfill!). We’re ready to fold! 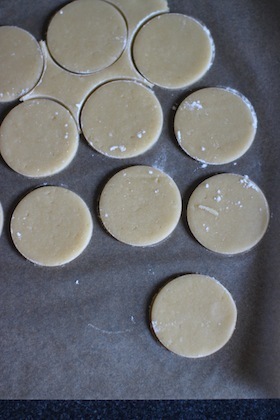 Starting with the bottom row of cookies: Fold the right side over half of the filling, pressing down slightly at both ends. Fold the left side over, pinching gently at the top (where it overlaps with the right side). Smooth the left side so that it’s symmetrical to the right, leaving a little window of filling visible. Fold up the bottom of the circle. 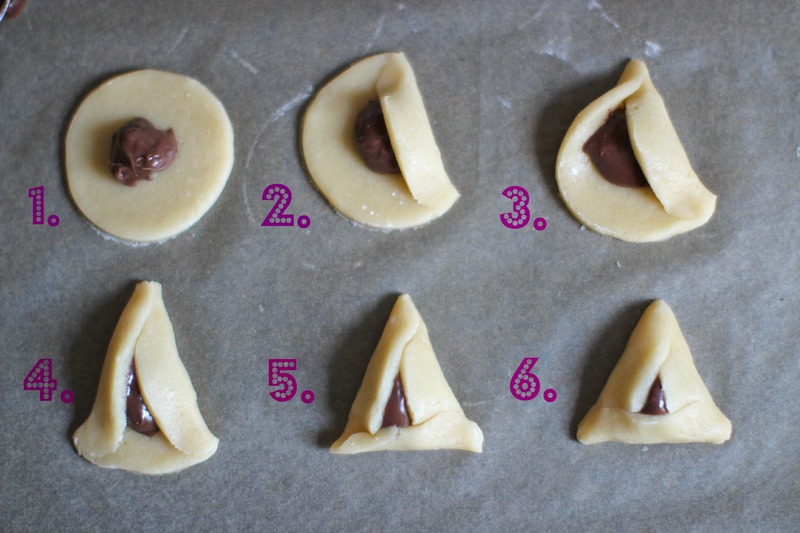 Pinch and nudge the Hamantaschen very gently, until it looks just like you want it to. Don’t stress, it’ll take a few times to get it just right! (Look at the step-by-step image in this post for a visual cue). (The dough might have little tiny tears as you form the Hamantaschen, but don’t worry about smoothing them out- it’s the sign of a deliciously buttery dough!). Gently transfer the first row of Hamantaschen to a cookie sheet lined with parchment, and continue with the rest of the dough. Transfer the cookie sheet to the refrigerator. Repeat with the second patty, placing cookies in the refrigerator when done. 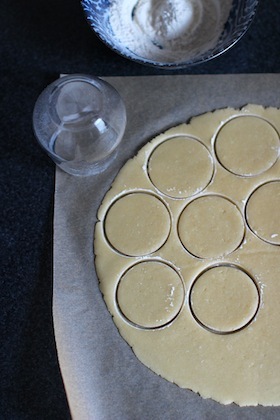 Gently press all of the dough scraps together (doing your best not to overwork them), and reroll. Fill, and form into Hamantaschen, and place in the fridge (you can set parchment on two plates, or on a large cutting board if you’re out of cookie sheets). Preheat the oven to 350F/180C, and position racks in the upper and lower thirds of the oven. Bake cookies for 8 to 10 minutes, rotating pans halfway through. The cookies are ready when they are pale golden at the edges. They should still feel puffy and moist to the touch; they will continue to harden while cooling. Repeat until all the cookies are baked. Slide the cookies, still on the parchment, onto racks to cool. Allow to cool completely. These are best the same day, but can be stored in an airtight container for 3-4 days. Oh no! I didn’t want to make anyone homesick! You should totally make these- they’re fun and so delicious! Purim Sameah from London ! These are sooo pretty! (I have this plate as well!) What is the history behind Hamantaschen… I’ve never heard of these! And I’m certain I’d never forget if I’d tasted one! would love a taste of one, Purim Sameach Charlotte !